Our Constitution is based on simple and powerful principles of justice and law as in due Process( Amendment 5 ), right to a speedy trial(Amendment 6) and no cruel or unusual punishment(Amendment 8). Article 3 of the Geneva Conventions guarantees that detainees be treated humanely and prohibits cruel treatment and torture. Guantanamo prison violates the Geneva Conventions and the US Constitution and makes a mockery out of our government’s concern about human rights.. 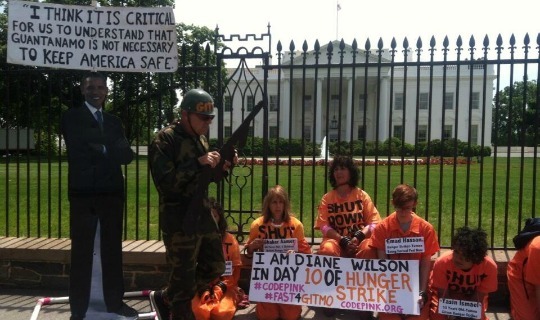 Currently, there are 160 detainees in Guantanamo and over 100 are engaged in a hunger strike. These detainees are willing to die because their imprisonment is forever, they had no rights or legal recourse, and they have lost all hope. To die is preferable to imprisonment at Guantanamo.86 current prisoners have been cleared for transfer to other countries, but none have been able to leave. These 86 people have been held for 11 years with no charges brought against them and many of them have been tortured and held in solitary confinement. Colonel Morris Davis, the past chief Prosecutor at Guantanamo, has stated that the system at Guantanamo is “fundamentally wrong “ and has called for closure along with 38 senior religious leaders. President Obama has recently repeated his position that the detention facility needs to be closed and prisoners transferred to third countries(if not a risk) or to the United States for adjudication. While Congress had made closing Guantanamo difficult, there are actions that the President can take today. President Obama can assign a senior White House Point person the job of closing the facility, and he can direct the Secretary of Defense Hagel to certify the 86 detainees who have been cleared for transfer. He can lift the administration imposed moratorium on the transfer of 57 Yemeni detainees to Yemen. He can also issue a signing statement that would supersede the law preventing use of federal funds to transfer prisoners. I call on president Obama to use his power to close Guantanamo. I call on Congress to fulfill its responsibility for upholding the Constitution and rule of law. I call on the citizens of our community and country to speak out for law, and justice. Democracy is dependent on respect for human rights. Act now to close Guantanamo. This entry was posted in Activism, Prison Justice, Uncategorized and tagged activism, colonel morris davis, due process, geneva convenetion, gitmo, guantanamo, president obama, secretaryy of defense hagel, she breathes, yemen, yemeni. Bookmark the permalink. ← How Are Our Struggles Related?